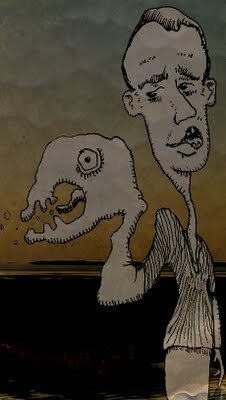 Sea monster-armed ventriloquisty guy camped out on First Encounter Beach this summer on Cape Cod. Last summer we came upon this other clown-faced boy. This one goes out to 13-year-old Tanya C who wrote me this summer and sent one of her mcglinch-inspired drawings, which, if her mom says it’s “OK’ I’ll post up here for you. This entry was posted in bay, beach, cape cod, claw, drawings, sea monster. Bookmark the permalink.